On March 26, the Mills art community lost one of its most revered and prolific members when professor Anna Valentina Murch died of cancer. Murch had been at Mills for 22 years and created art installations around the world. Murch was born in Scotland and grew up in England, where she earned a B.A. at the University of Leicester, a masters degree from the Royal College of Art in London and a second masters degree at the Architectural Association in London. In 1988, Murch married Doug Hollis, an environmental artist; the two collaborated on numerous art installations until Murch’s death. Murch’s art can be seen in numerous places throughout the US and Europe. While at Mills, she was awarded numerous faculty grants and served as the Joan Danforth Chair of Studio Art from 2005 to 2007. Catherine Wagner, professor of studio art, was a colleague of Murch’s for about 20 years. To commemorate Murch, MFA students Veva Edelson and Malena Lopez-Maggi recently collaborated on an art project they hoped would provide emotional release for the community. Together, the two created a hearth using wood that they charred in a Japanese technique called shou sugi-ban; traditionally, this process involves charring the wood, cooling it, cleaning it and finishing with natural oil, which is done to create a layer of protection over the wood. According to Lopez-Maggi, the hearth was inspired by a 1514 etching by Alfred Durer called Melancholia I. The hearth has a slot at the top where students and community members can place notes or messages for Murch or about their grief. Murch was Lopez-Maggi’s advisor and mentor; she described Murch as “radiant” and as a “pillar” of the Mills art community. Although Edelson only had the opportunity to work with Murch for one semester, she felt that Murch was able to offer insight about her students’ work and was extremely perceptive and inspiring. Lopez-Maggi agreed that Murch’s work was unique, as were her thought processes. A memorial was held on May 4 at the Mills College Art Museum for Murch. During the memorial, the hearth constructed by Edelson and Lopez-Maggi was burned as a way of metaphorically releasing the community’s grief. To learn more about Anna Valentina Murch and her work, visit her website. This post appeared in The Campanil‘s special Commencement issue which came out on Tuesday, May 6. 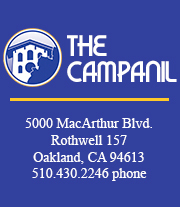 For more graduation-related posts, check out The Campanil‘s designated 2014 Commencement webpage here or click on the “Commencement” link in the upper right hand corner of the header.